The giants parade to the Town Hall in preparation for the celebration. 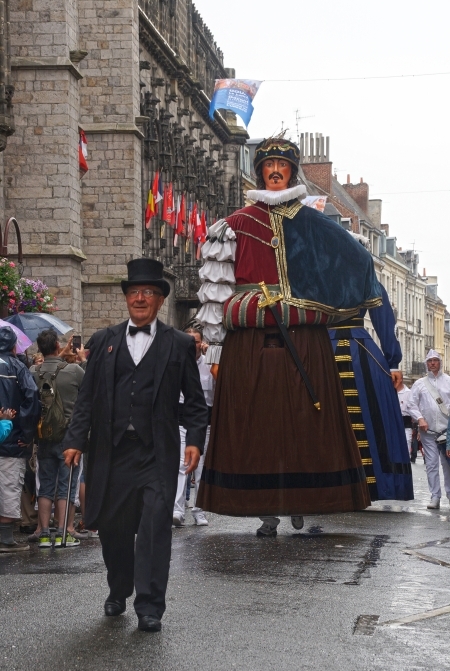 Many towns in Europe maintain a tradition that has continued since the medieval ages: the processional giant. 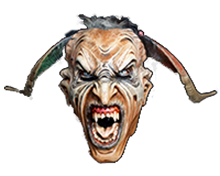 The giant is a huge costume worn by masqueraders representing an historical figure, cultural character, or monster. Giants parade and dance in European towns as diverse as Outeiro Seco of northern Portugal; Barcelona and Pamplona in Spain; and the subject of today’s blog entry, Douai, France. The tradition has also been transmitted to Latin America, where many towns throughout Mexico, Central America, and South America feature parades with giant costumes of a similar type. The entry into the armature of a 6-carrier giant. Gayant himself, launching the 2015 parade. The origins of the tradition are uncertain. The giants might represent the local nobility and may have originally been paraded in honor of a birthday or military victory. Others believe the giants originally represented Biblical figures or saints, and were used in religious processions. In some places, particularly Spain, it is likely that the giants are linked to celebrations of the reconquest of southern Spain from the Moors. In Douai, the procession seems to originate in the failure of the French to capture Douai from the Count of Flanders in 1479. To thank the town’s patron saint, Maurand de Douai, the townspeople held a procession on the day of the attack. Ironically, the tradition continues despite Douai’s eventual incorporation into France. Douai is located in the Department of Nord-Pas de Calais, on the border of Belgium. 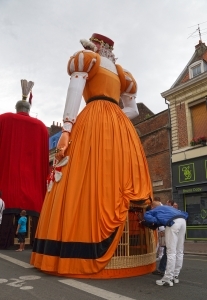 The term used for the first costume was gayant, an archaic spelling of géant (giant). 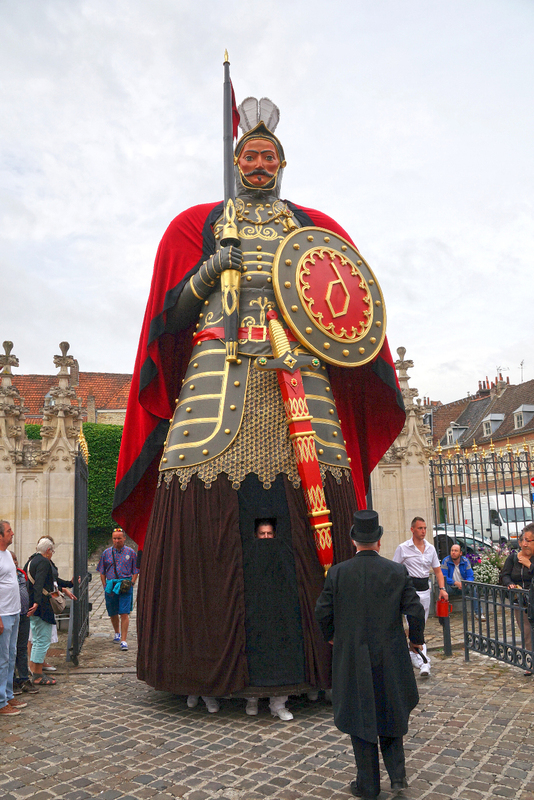 The original Gayant, a tall knight looking nothing like St. Maurand, is first recorded as appearing in 1530 and was paraded by a fraternity of carriers. In 1531, a female counterpart began appearing in the name of Marie Cagenon. Much later, the pair was joined by a trio of smaller giants, representing their children: Jacquot (1675), Fillon (1687) and Binbin (1715). Although the original celebration is believed to have been held on June 16, today the Fête always occurs for three days, with the main parade on the Sunday following July 5th. 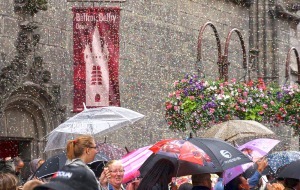 The crowd is showered with confetti during the Sunday parade. The modern celebration begins on Sunday morning, with a clown wearing a horse costume, the Sot des Cannoniers, accompanied by two drums as the giants leave their home on the rue de Lambres. Gayant and his wife leave first, followed by the children. They proceed to the Town Hall, with the porters stopping along the way for spiked coffee. 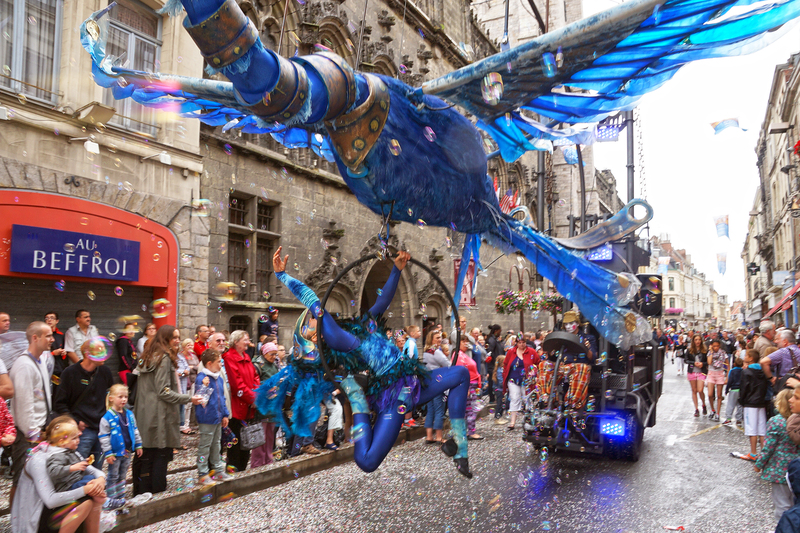 An acrobat swings from an ingenious flying bid-shaped float in the 2015 parade. The giants remain in the square, then after a brief tour perform four “Rigodon Dances” (Danses du Rigodon) to the music of a municipal band. The dance ends with throwing treats to the crowd and a flight of pigeons. 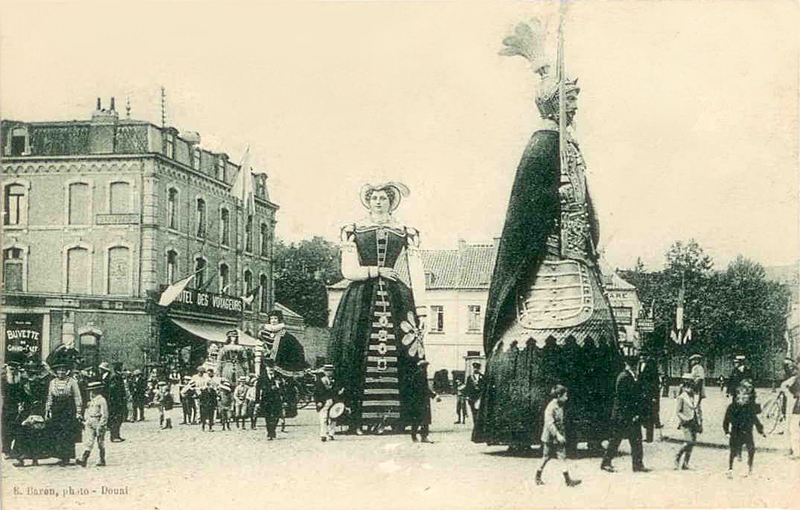 In the afternoon, the grand parade down the streets of Douai begins. The giants hold a special place in the parade, but the parade also includes floats and groups of masqueraders. Popular culture, acrobats, and musicians all play a prominent role. On the following Monday, the giants are displayed around town, and then returned to storage for the rest of the year. Throughout the celebration are other festivities, such as archery competitions, jeux du billon, and dances performed by the three small giants for the sick at the town hospital. The large giants weigh up to 370 kilograms (814 lbs.) and can be 8.5 meters (almost 28 feet) tall. They require six carriers each, which requires great stamina and coordination to dance. The smaller giants are carried by a single person. In each case, the carrier wears a padded armature that fits over the shoulders. The people of Douai have pride in their time-honored tradition and great affection for the characters of the procession. 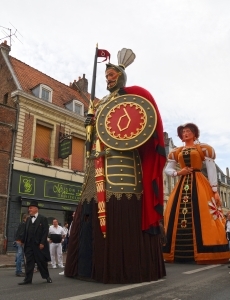 The continuation of this tradition helps set Douai apart as a culturally unique part of northern France. 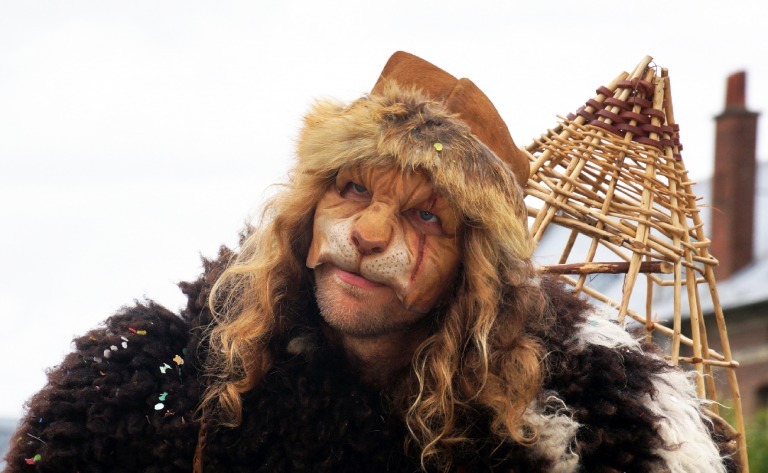 A masquerader from a group of lion-people in the 2015 parade of Douai. The géants (here, Jacquot) are featured prominently in the Sunday parade. 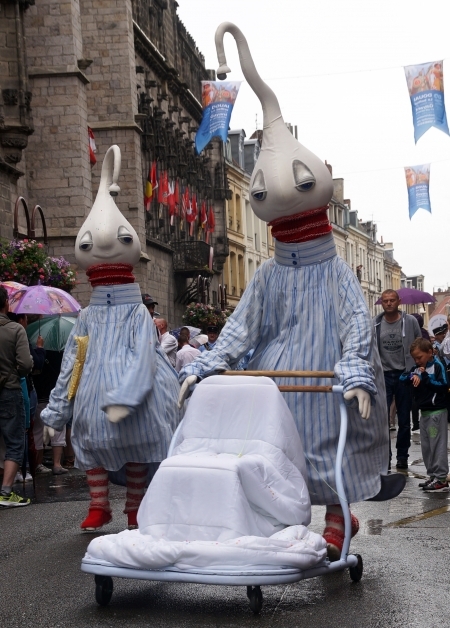 The modern parade includes characters from popular culture, such as these … whatever they are. Traditional floats accompany the parade, such as this giant bull. 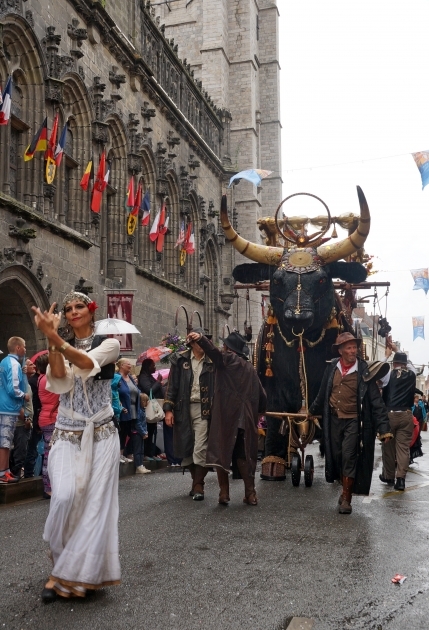 A devil in the 2015 parade of Douai.